Green nodded home a corner inside two minutes before Laing lashed home 10 minutes with a stunning half volley. A goalkeeping error from Joao Mendes allowed Maguire to add the third on the half hour mark to complete the scoring a routine victory for Blyth. After a two and a half week break due to the weather Spartans were at the races from the get go and won a corner seconds after the kick-off. Rivers pinpoint delivery was headed low into the bottom right hand corner by Green setting the tone for the afternoon. 10 minutes later another set piece allowed Spartans to send their centre-back pairing forward and Laing was the beneficiary. He latched on a bouncing ball on the penalty spot and rifled a half volley into the top left–hand corner. On 17 minutes Spartans went close to adding a third, Jamie Holmes found space on the left of the Blyth attack, cut onto his right foot, and curled an effort just wide of Mendes’s left hand upright. Two minutes later Green tried an audacious lob from 50 yards out, but Mendes tracked the effort well and comfortable claimed in his penalty area. Spartans were awarded a free-kick a free-kick on 21 minutes around 25 yards from goal on the right edge of the penalty area. Michael Liddle curled a delicious effort over the wall and toward the top right-hand corner – palmed away by Mendes. Connor Oliver was next to take aim as he tried his luck from the halfway. Mendes, panicking, just about managed to track the ball and produced a full-length diving stop – in reality the ball was heading well wide of the goal. With half an hour played, Mendes called for – and subsequently dropped – another Rivers set-piece, Maguire on hand to round the ‘keeper and slotted the ball past a defender on the line. With a comfortable half time lead, Alun Armstrong was able to introduce David Atkinson for his third debut for the club. The second period followed a similar patter early, with Mendes saving at the feet of Maguire four minutes in. Mid-way through the second half Rivers mazy run almost produced an end product, but his effort from the edge of the area was dealt with by Mendes. 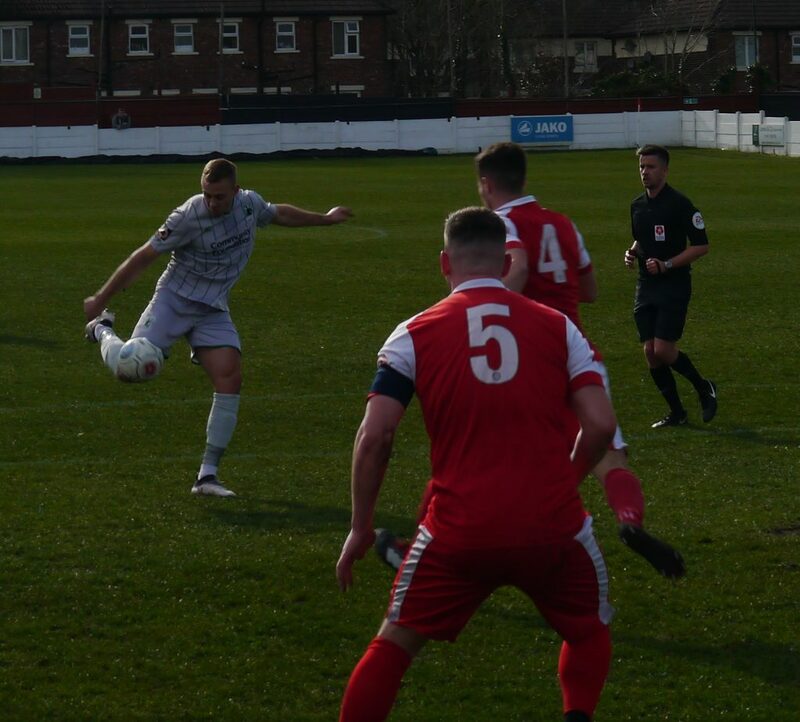 Matthew Regan was the next Ashton United man to go close as he thundered a right footed effort well over the bar from 20 yards out. Spartans have now lost just one of their previous 11 away trips in the National League North and face trips to AFC Telford and Curzon Ashton in the next nine days. Blyth Spartans | Jameson, Horner, Liddle, Green, Buddle, Laing, Rivers (Wrightson), Mullen (Atkinson), Maguire ©, Oliver, Holmes (Dale).